I received my Bilstein 6112 47-273702 shocks today and you were right, these shocks are huge. I placed my order on 3/28/19. The part number on the box has me questioning if I received the correct product. It looks like the right product, but the part number on the box is 24-242509. Is that what you received as well? I'm getting rid of the factory magnetic shocks because they're way too stiff and replacing it with the 6112's and 5160's in the rear. I'll be removing the rough country 2.5" lower spacer and installing the 6112's at the top setting. If my truck isn't level after, I may install a half inch lower spacer to even it out. I'm using the x-ineering delete kit to get rid of any alarms. I'm looking forward to a smoother ride. Those magnetic shocks are way too jarring driving on rough roads. I'm hoping to have mine installed by Saturday morning. Thanks for sharing that you received your shocks. I test drove a 2018 chevy truck with the 6.2l engine about a week ago. I noticed the same lurching and jerking when coming to a stop, and downshifting between 2nd and 1st gear that you described in an earlier post. The truck had only 7 miles on it. It felt a bit like hitting the brake too hard but my foot was nowhere near the brake pedal...After driving another Chevy and three GMCs I went with a GMC sierra SLT Z71.....love it so far. Thanks for the info Robert. I'm taking my truck in tomorrow to have them check it again and I'm going to start pushing for a new transmission. Even if they can fix the problem, I'm curious if all the problems I've had so far have done any damage. I had the exact same thing happen to me. I was turning left at an intersection with cars coming towards me. I had a break in the oncoming traffic, so I took my foot off the break and tried to accelerate. My truck began to roll in front of the oncoming cars because of a slight grade that I was on, but it didn't accelerate like it should have. I took my foot off the gas and tried again only to launch my truck through the turn at the intersection (unexpectedly fast) with the oncoming cars being dangerously close. It scared me too. I've also been experiencing a hard shift when it's cold outside going from park to drive. It's a long 2 second lag after I put the transmission in drive that it seems to slam into gear and the entire truck shakes. This is my first GM truck and I've had too many issues with it to leave me with any confidence to buy another when it's time. I'm curious how the ZF 8-speed that Ram has compares to GMs 8-speed. Below is a 'cut and paste' from another thread with some of my other problems. 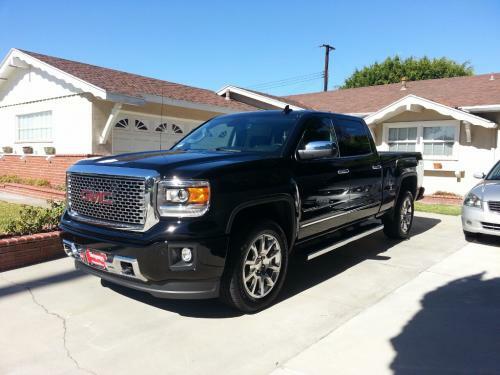 **************************************************************************************************************************************************************************** I got my 2015 Sierra Denali (6.2L, 8 speed, 2WD, crew cab, 6.5' bed) on November 5th 2014. In December 2014, my navigation system started showing me driving 50 miles away from my actual location and the onstar stopped working. It took a few weeks to get new parts, but they had to replace my entire main computer that handles the nav and onstar.Approximately January/February 2015, my transmission was jerking when I would come to a stop. It feels as though it's holding on to 2nd gear until I come to a complete stop and then it jerks it into 1st gear and jolts my truck forward. There is also a audible clunking/banging noise coming from the transmission when this happens. ----- I took my truck in to the GMC dealer and they explained they explained they applied an update to the 'transmission control module' (but the technician also . That seemed to get rid of the problem. SIDE NOTE: When I took my truck in, they did not drive the truck or have me drive it with a technician riding along to understand what I was describing. They simply took the truck into the bay and reset the 'learning' feature on the transmission. After they applied the update/reset the learning feature, I drove the truck with a technician and I confirmed the problem was no longer noticeable.Approximately early June, I took my truck in for an oil change, at which point I was notified of a recall on the 'Torque Converter Clutch'. They fixed the recall by applying a update to the torque converter clutch and that caused the problem to reappear in my transmission again. I took my truck in this morning to have it checked out again. I asked for a technician to drive my truck prior to fixing anything. The technician stated he did feel what I am talking about and wasn't immediately sure of what could be causing the problem. I was told they don't have time to find out what the problem is today and was asked to come back in two days when they have time.The transmission is great up-shifting and down-shifting on all gears from 2nd through 8th gear. 1st gear is the only time I have issues. What i'm getting from my own experience and from what I've read from other peoples experience, they don't do anything to fix the transmission problem. They just reset the learning feature and after every couple thousand miles, the problem will keep coming back. I got my 2015 Sierra Denali (6.2L, 8 speed, 2WD, crew cab, 6.5' bed) on November 5th 2014. In December 2014, my navigation system started showing me driving 50 miles away from my actual location and the onstar stopped working. It took a few weeks to get new parts, but they had to replace my entire main computer that handles the nav and onstar.Approximately January/February 2015, my transmission was jerking when I would come to a stop. It feels as though it's holding on to 2nd gear until I come to a complete stop and then it jerks it into 1st gear and jolts my truck forward. There is also a audible clunking/banging noise coming from the transmission when this happens. ----- I took my truck in to the GMC dealer and they explained they explained they applied an update to the 'transmission control module' (but the technician also . That seemed to get rid of the problem. SIDE NOTE: When I took my truck in, they did not drive the truck or have me drive it with a technician riding along to understand what I was describing. They simply took the truck into the bay and reset the 'learning' feature on the transmission. After they applied the update/reset the learning feature, I drove the truck with a technician and I confirmed the problem was no longer noticeable.Approximately early June, I took my truck in for an oil change, at which point I was notified of a recall on the 'Torque Converter Clutch'. They fixed the recall by applying a update to the torque converter clutch and that caused the problem to reappear in my transmission again. I took my truck in this morning to have it checked out again. I asked for a technician to drive my truck prior to fixing anything. The technician stated he did feel what I am talking about and wasn't immediately sure of what could be causing the problem. I was told they don't have time to find out what the problem is today and was asked to come back in two days when they have time.The transmission is great up-shifting and down-shifting on all gears from 2nd through 8th gear. 1st gear is the only time I have issues. What i'm getting from my own experience and from what I've read from other peoples experience, they don't do anything to fix the transmission problem. They just reset the learning feature and after every couple thousand miles, the problem will keep coming back. I'm at 13,500 miles since November and I've been averaging 14-16mpg. I reset my trip computer every fill up. I do equal amounts city and highway driving. Typical freeway speeds of 70-80mph. 2015 Sierra 6.2l, crew cab, 6.5' bed, 2wd, 8 speed trans, 2.5" leveling kit. I always use 91 octane. I live in California and use my a/c frequently. Who All Has The New 8 Speed 6.2L Engine ??? Thanks for the tip, i'll try turning the traction control off. I definitely agree about sprucing up the Denali. For roughly the same price, Ford offers the Limited Edition F-150 with 22 inch rims and power steps standard. Hi Andraya, Thanks for the response. This seems to be an issue that a lot of people are experiencing. Before I spend my day at a dealership, is GM aware of what the problem may be and should I be concerned? Thanks to everyone that responded with similar issues. I'll give an update once the service department has a chance to check my truck. Anyone with a 2015 6.2l with the 8 speed auto? I just picked up my 2015 Sierra 1500 Denali on Nov 5th. 6.2 with 8 speed (I placed my order mid September). I'm probably not the best person for comparisons though because it's my first truck (been a car person until now). I do notice some hesitataion going from 1st to 2nd gear when I drive normal, but after that, everything is smooth. When I lay into the gas, theres absolutely no hesitation. I have just over 600 miles on it so far and i've been averaging 14.8 mpg (equal amount city and highway driving).